Salads are served on their own, may be as a healthy snack option sometimes, however raitas are usually served as a part of the meal. But be it a meal or a part of the meal, protein is required throughout the day for various bodily functions, of which maintenance and repair of body cells and building immune cells are some of the important functions. Include an array of pulses and legumes and their sprouts to make up your protein requirement. Chick Pea Salad with Mint Dressing, Kulith Salad, Minty Bean Salad etc. are well researched recipes just for you. Explore sprouts to make recipes like Mixed Sprouts Salad, Baby Corn, Bea Sprouts and Cucumber Salad with Lemony Basil Dressing. When we talk of curds, a lot of people prefer flavoured curds. 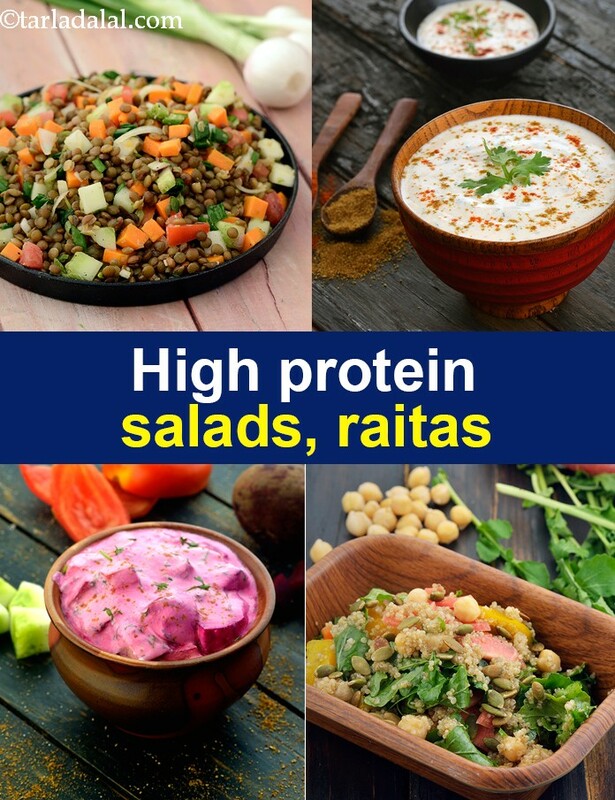 But believe me you can set curds at home, toss in fruits or veggies of your choice and flavour them with fresh herbs and spices to whip up quick fix protein packed raitas. Beetroot, Cucumber and Tomato Raita, Lauki aur Phudine ka Raita, Mixed Veggie Raita are a few our creations shared in this section.